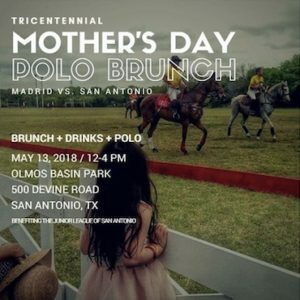 Join us Sunday May 13th as we celebrate Mother’s Day with a Special Brunch and Polo tournement at the Tricentennial Mother’s Day Polo Brunch benefiting the Junior League of San Antonio. This family friendly event will feature a hat contest, entertainment, and an exciting pro-am polo match featuring the San Antonio Polo Club team playing against the visiting Madrid Polo team from Spain. General admission & VIP tickets are available for purchase on the San Antonio Polo Club’s website. Tricentennial Cup General Admission is $15 online and $25 at the gate. VIP tickets include an Elegant Tented Brunch for $150 per person or a VIP table of 8 for $1,000. In honor of San Antonio’s polo history and the city’s 300th anniversary, free general admission is offered to military guests as well as free admission to children under 10 years old. A portion of ticket sales benefit the important work of the Junior League of San Antonio.